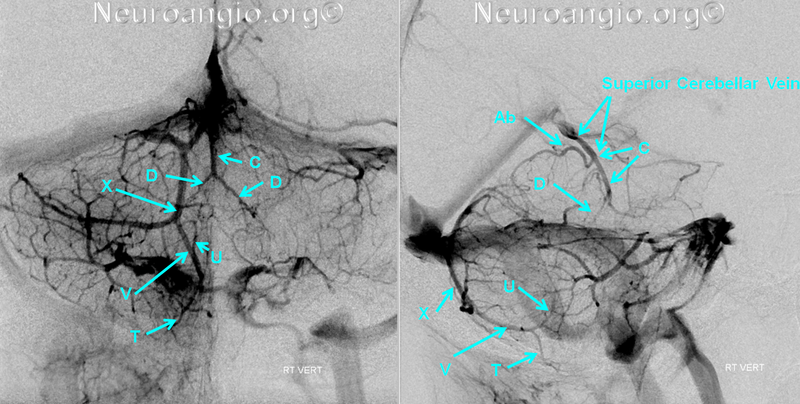 The Anterior Pontomesencephalic Vein, as well as Anterior Medullary vein (M). Rhoton calls the anterior pontomesencephalic vein the “Medial anterior pontomesencephalic vein”. 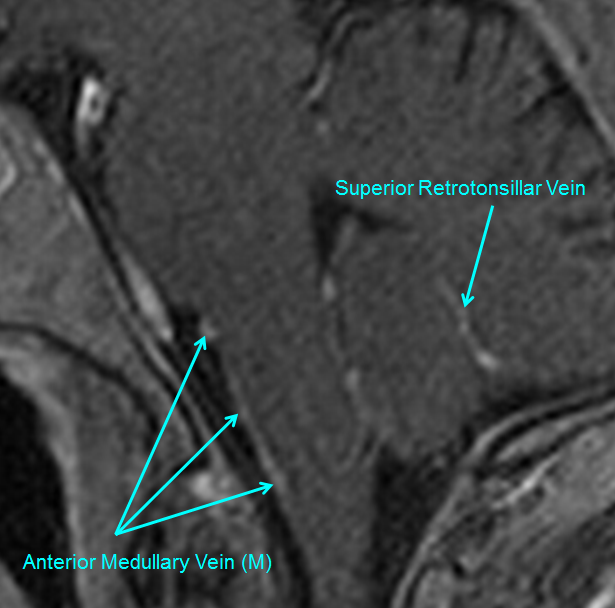 The anterior medullary vein is named “medial anterior medullary vein”. Rhoton’s terminology is important in recognising that the anterior group is sometimes made up of “Lateral anterior pontomesencephalic vein” and “lateral anterior medullary vein” — reflecting the fact that these veins often don’t run exactly in midline, and may even be paired on the anterior surface. Again, the key concept of these pages is to show that knowledge of where the vein is in relation to the brainstem is more important than terminology. 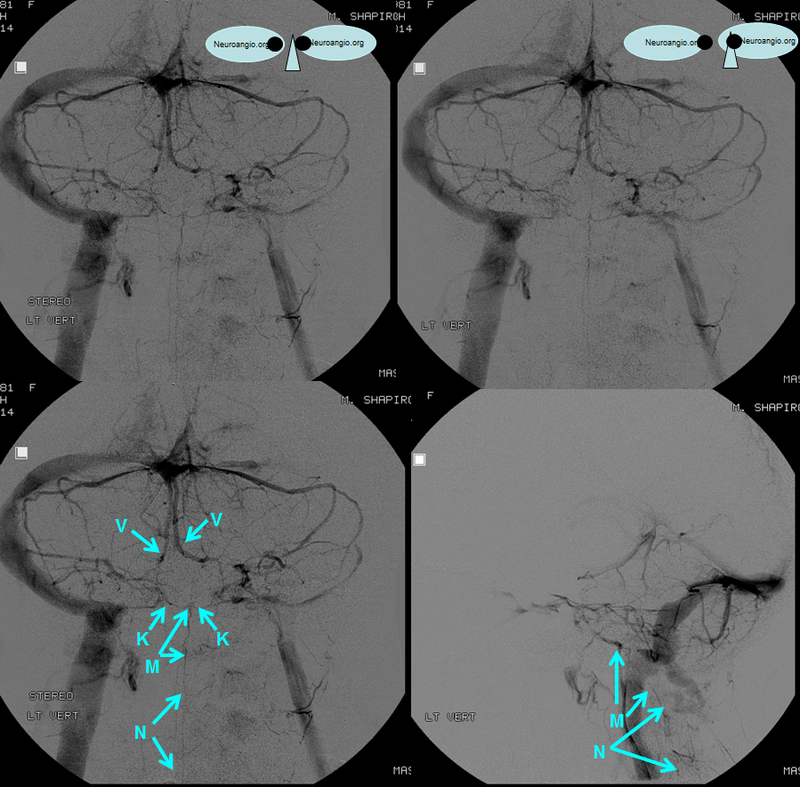 Rostrally, the pontomesencephalic vein usually collateralises with the peduncular veins (F), which are connected by the interpeduncular vein, also known as the posterior communicating vein. Caudally, the pontomesencephalic vein may be contiguous with the anterior medullary vein (M), which is contiguous with the anterior spinal vein (N). This is the easiest system to understand — it marks the anterior border of the brainstem in the lateral view, and as such is usually located adjacent to the basilar artery. 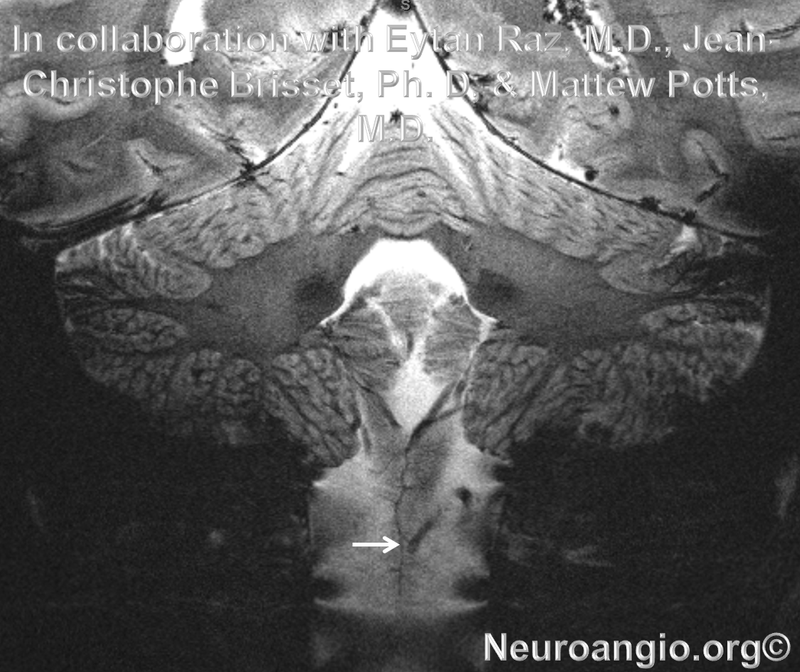 It is a truer landmark for the brainstem than the often tortuous basilar, as seen in the following example where the whole system is particularly well-developed (the anterior medullary vein is mislabeled “E” and should be “M”). Notice how low the pons sits in repation to the jugular bulb. 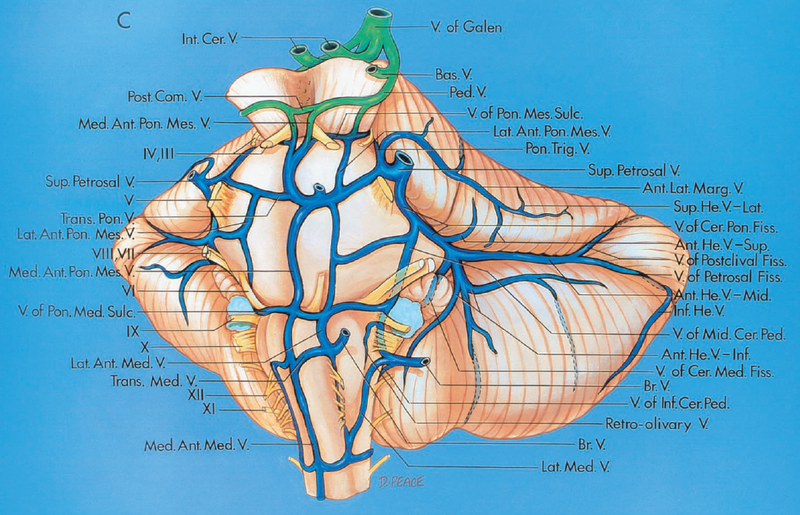 The 4th ventricle is located essentially behind the pons and below the precentral vein (a.k.a. 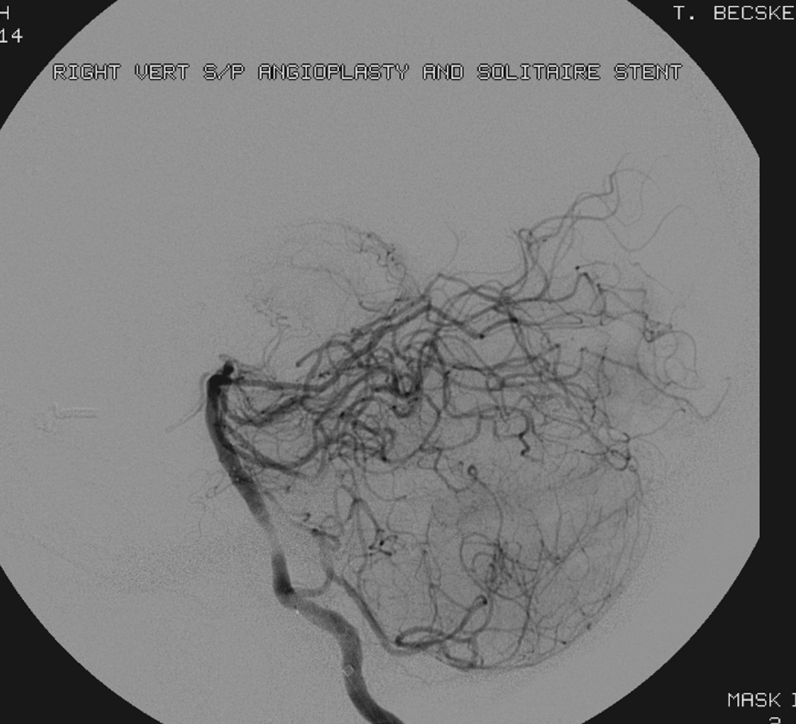 the cerebellomesencephalic fissure vein in Rhoton). 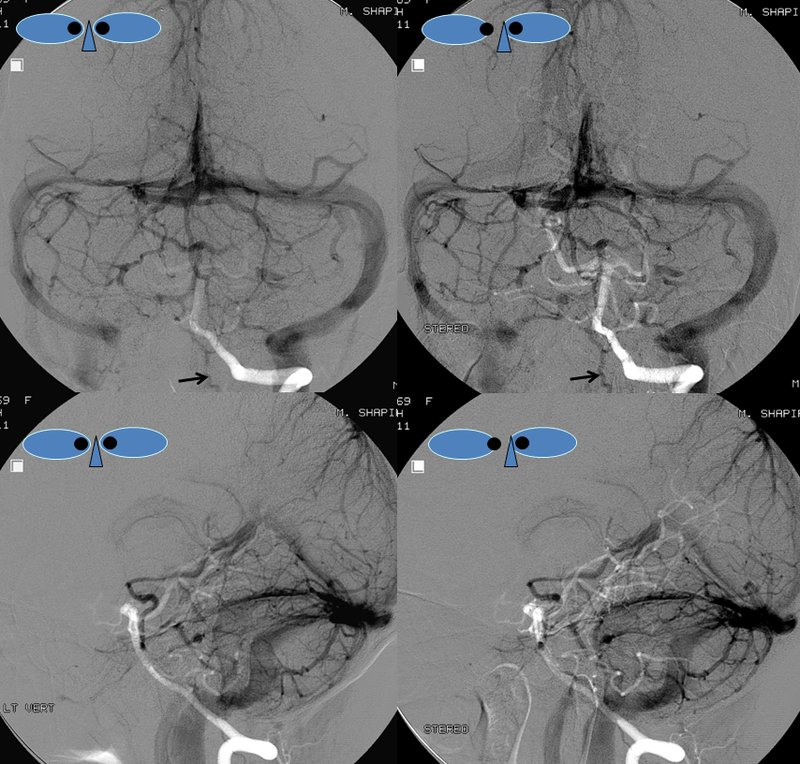 Another instance of very dominant anterior pontomesencephalic vein, draining via peduncular veins (F) into the basilar vein (B). 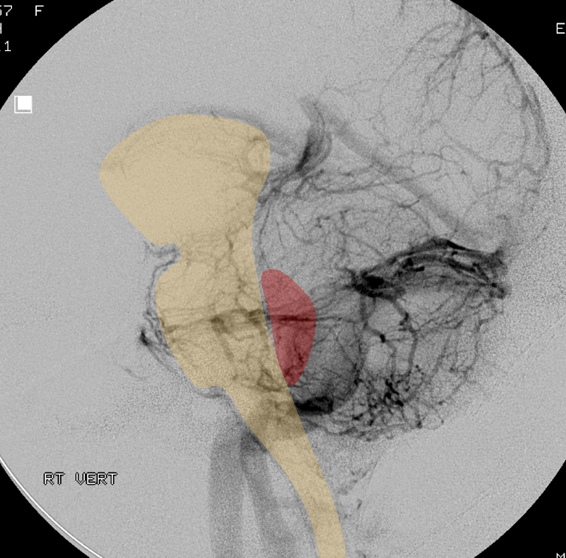 This is particulary well seen on the Townes frontal view, where it is critical to understand the relationship of the brainstem with respect to the venous structures. 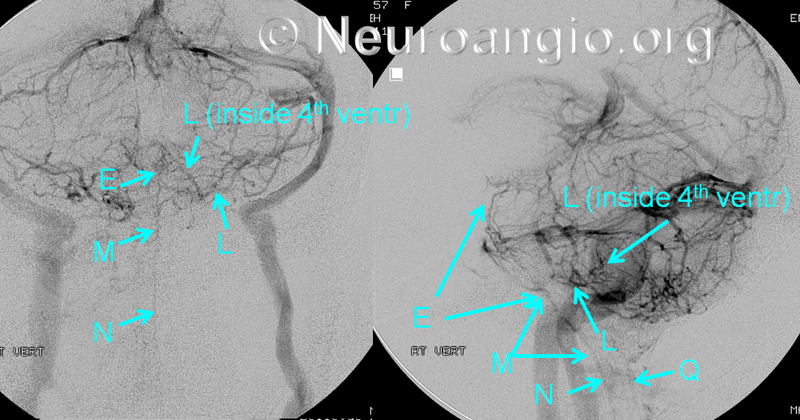 The same case, with brainstem overlay; again, the most important thing is to understand the relationship between the veins and the brain. The peduncular vein (F) outlines the cerebral peduncle, connecting to the Basal Vein (B). The bottom line is that at a given level, one may see a relatively “balanced” pattern or some form of dominance of one or more longitudinal systems, with corresponding hypoplasia of the other longitudinal channels at the same level. For example, dominant lateral mesencaphalic vein usually implies hypoplasia of the anterior pontomesencephalic and precentral veins. This is no different from the situation in the supratentorial compartment, where for example dominant Labbe means hypoplastic Trolard, etc. 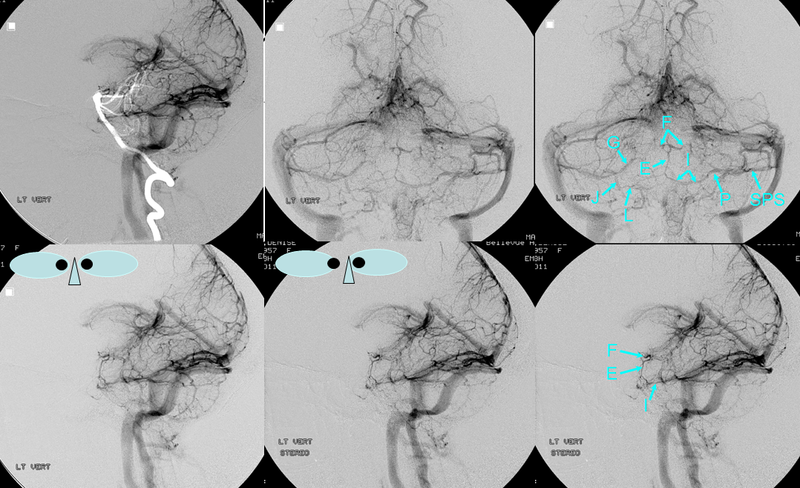 In the above example, the anterior group his highly dominant, and therefore the precentral vein (C) and the lateral mesencephalic vein (H) are hypoplastic. In the example below, the lateral mesencephalic (H) group is dominant, and the anterior group is correspondingly hypoplastic. Finally, in this patient the precentral vein (C) and its brachial tributaries (D), a.k.a. 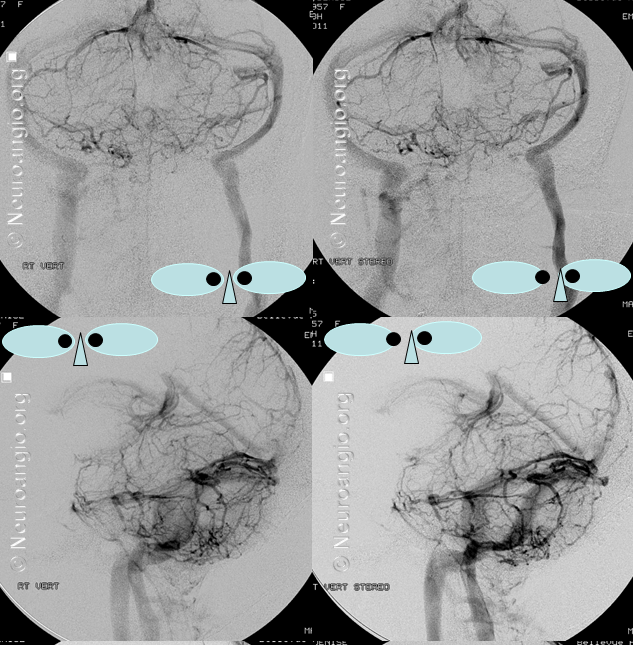 veins of the superior cerebellar peduncle according to Rhoton, are dominant, and therefore both the anterior pontomesencephalic (E) and lateral mesencephalic (H) veins are hypoplastic. You get the idea. The same is true for the transverse group of veins, such as the pontomesencephalic sulcus, transverese ponine, and pontomedullary sulcus veins. 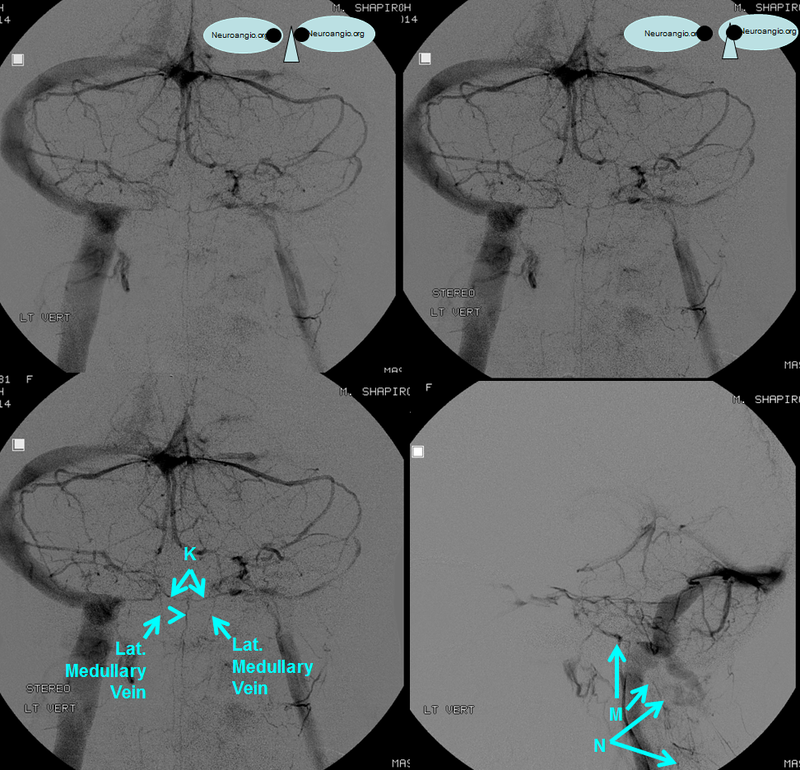 The anterior pontomesencephalic vein usually runs adjacent to the basilar artery, as seen in this image where the arterial phase is selected as a “mask” image, this serving as a while landmark on a gray background. It is important to understand the position of the anterior group in the frontal view. The optimal frontal view for the brainstem veins is the Townes view, which looks “down the barrel” of the brainstem somewhat. Even though the brainstem is thus foreshortened, the various cerebellar and brainstem veins overlap less and the brainstem group of veins sits lower than the cerebellar veins. MRI is a very nice way to see these veins. The anterior pontomesencephalic and anterior medullary veins will be closely applied to the surface of the brainstem, and are a better landmark than the basilar. 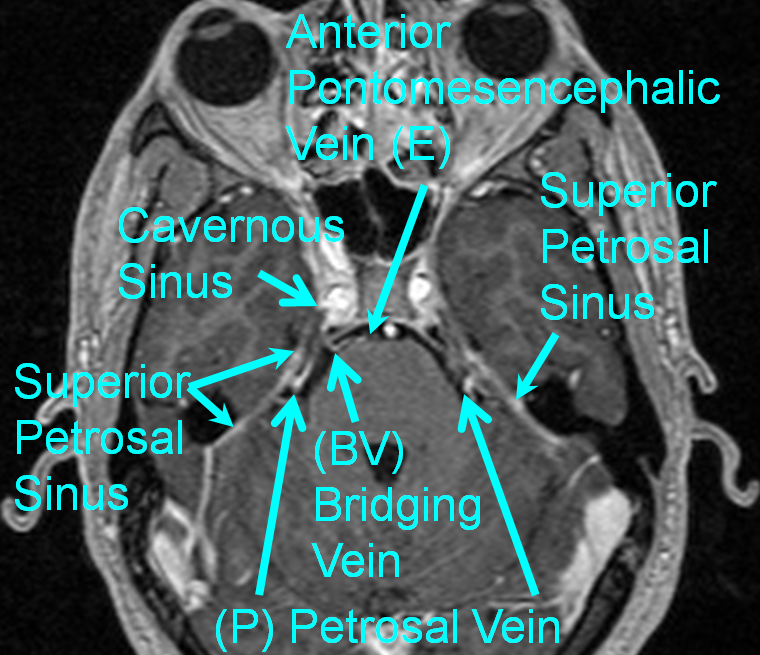 The anterior brainstem group (anterior pontomesencephalic, anterior pontomedullary, anterior medullary) of veins empty into the Petrosal vein (P), the Bridging Veins (BV) which directly connect the anterior veins to the cavernous sinus or inferior petrosal sinus, into the posterior mesencephalic (PM) veins draining into the Galen (A), or rarely via the anterior spinal vein () into the cervical spinal bridging /radicular veins and epidural venous plexus (see Spinal Venous Vasculature). This is not always the case, however. 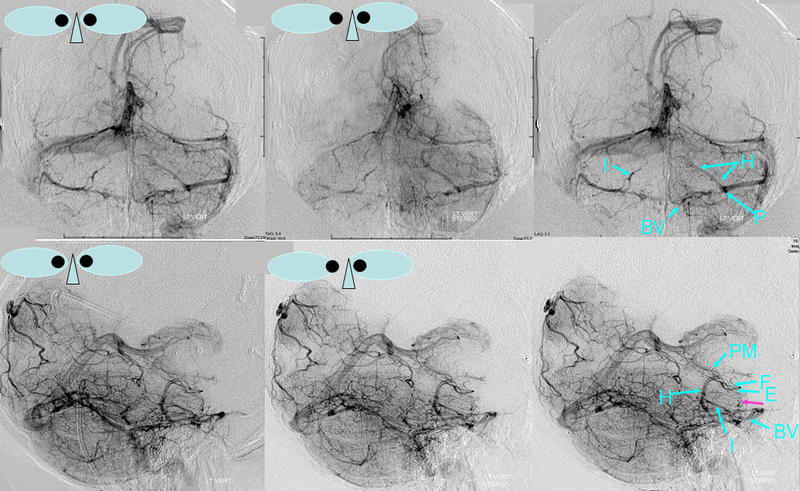 Bridging Veins (BV) are very common, and connect the anterior brainstem veins to the posterior portion of the cavernous sinus across the prepontine cistern. 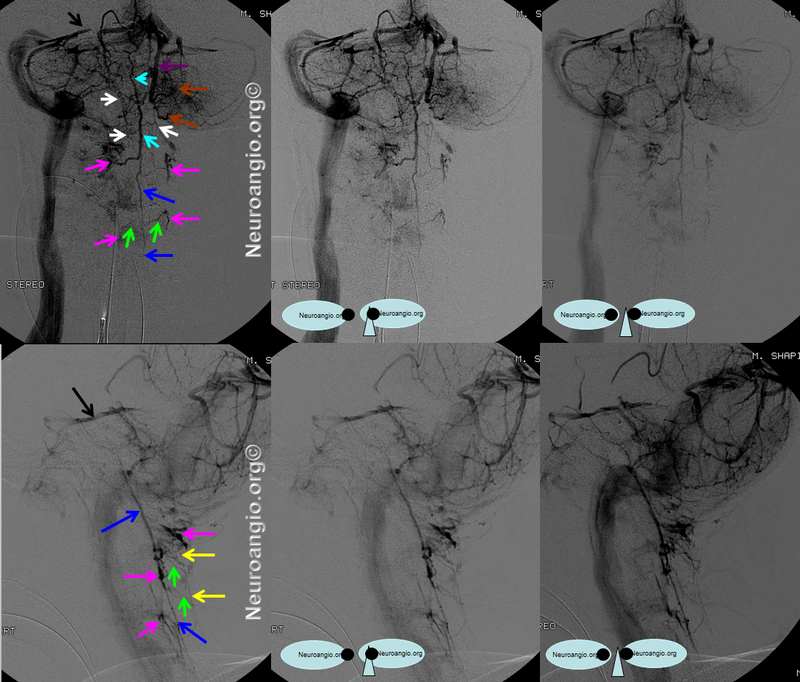 Here, large bridging veins in the prepontine cistern (light blue, dark blue) are in the angio and MRI of the same patient, draining the anterior group into the posterior cavernous sinuses (pink). Notice also elegantly seen transverse pontine vein (white) and other unnamed transverse pontine veins (yellow, brown). 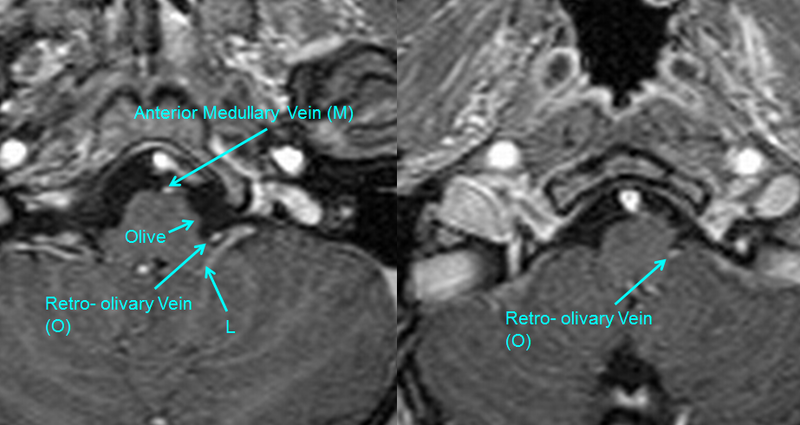 MRI demonstrating homology of the Bridging Vein (BV) draining into the Cavernous Sinus with the Petrosal vein (P) draining into the Superior Petrosal Sinus. The same, in stereo. The anterior medullary vein is light blue, anterior spinal dark blue, the cord tributaries of radicular veins are green, lateral spinal veins are white, and the epidural venous plexus into which the spinal veins drain is pink. Here is an illustration of the veins of the pontomedullary sulcus (K): The stereo is from behind, to best showcase the inferior vermian veins. Yung Peng Huang et. al. The Veins of The Posterior Fossa — Anterior or Petrosal Draining Group. September 1968. American Journal of Radiology. For a full text PDF click here. 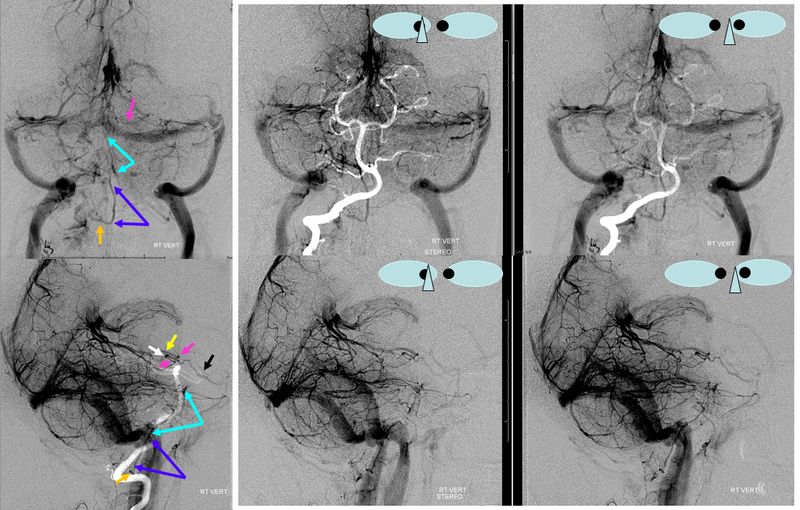 Albert Rhoton, The Posterior Fossa Veins, Neurosurgery. 2000 Sep;47(3 Suppl):S69-92. Albert Rhoton, The Cerebellopontine Angle and Posterior Fossa Cranial Nerves by the Retrosigmoid Approach. Neurosurgery. 2000 Sep;47(3 Suppl):S93-129. 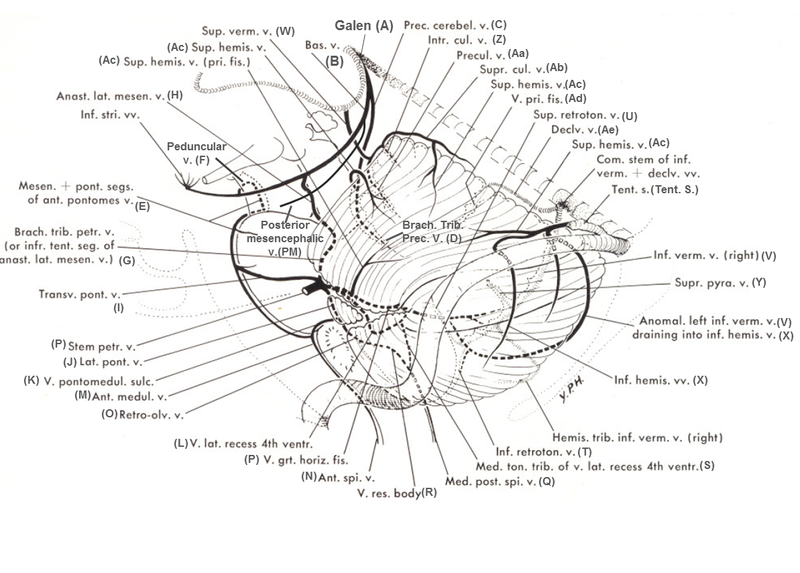 Albert Rhoton, The Posterior Fossa Veins. Neurosurgery 2000 Sept 47(3), S69-92.